Sugar, sugar, sugar... How many good memories are linked to sugar? Those ice creams, jellies, birthday cakes, candies, cookies, etc etc etc... For a while or in strict moderation is fine, but many people overpass this. Sugar, as we all know, is the cause of one of the most widespread diseases in the world: obesity, diabetes, and in some instances cancer. No matter how much information is broadcast on the internet, television, radio and print media, food producers always find a way to attract customers and with more and new products that benefit them and no one else. Have you ever wondered how much sugar can you consume a day? The answer varies depending on the type of person, There are people that can eat a lot of sugar without distress, while others have to avoid it as much as they can. According to a study from the American Heart Association (AHA) On average, the maximum amount of sugar you are supposed to eat in a day is 7 grams. To put that into perspective, one 12-oz can of Coke contains 140 calories from sugar, while a regular-sized Snickers bar contains 120 calories from sugar. The World Health Organization (WHO) recommends limiting salt intake to less than 5 grams per day, saturated fat to 10% of daily calorie intake, and sugar to less than 10% for a healthy weight person who eats 2,000 calories per day. Sugar abuse began to change in the 1970s and 1980s when the focus was on heart problems and fat intake. The United States, Brazil, Argentina, Australia, and Mexico are the countries with the highest per capita sugar consumption, exceeding the world average (17 teaspoons per day) and the maximum recommended daily dose (6 teaspoons per day for women and 9 for men). The world average sugar consumption grew by 45% in the last 30 years, going from 8 teaspoons daily to 17. As you may know, Diabetes is associated with the consumption of sugary beverages, since a single can contains approximately 8 tablespoons of sugar (more than the recommended daily dose). In a worldwide scale, 35% of adults are considered overweight and 12% obese. Obesity rates increased from 5% for men and 8% for women in 1980 to 10% for men and $14 for women in 2008. How Has Sugar changed WorldWide Obesity? Below are some recent estimates from The World Health Organization (WHO) at a global level. In 2016, more than 1.9 billion adults aged 18 and over were overweight, of whom more than 650 million were obese. In 2016, 39% of adults aged 18 and over (39% of men and 40% of women) were overweight. Overall, by 2016, about 13% of the world's adult population (11% of men and 15% of women) were obese. Between 1975 and 2016, the global prevalence of obesity has almost tripled. In 2016 there were more than 340 million overweight or obese children and adolescents (ages 5-19). The prevalence of overweight and obesity in children and adolescents (ages 5-19) has increased dramatically, from 4% in 1975 to over 18% in 2016. This increase has been similar in both sexes: 18% of girls and 19% of overweight boys in 2016. While in 1975 there were less than 1% of obese children and adolescents between the ages of 5 and 19, in 2016 there were 124 million (6% of girls and 8% of boys). Globally speaking, overweight and obesity are linked to more deaths than underweight. In general, more people are obese than underweight. This is true in all regions except parts of sub-Saharan Africa and Asia. And what are the benefits or losing fat? 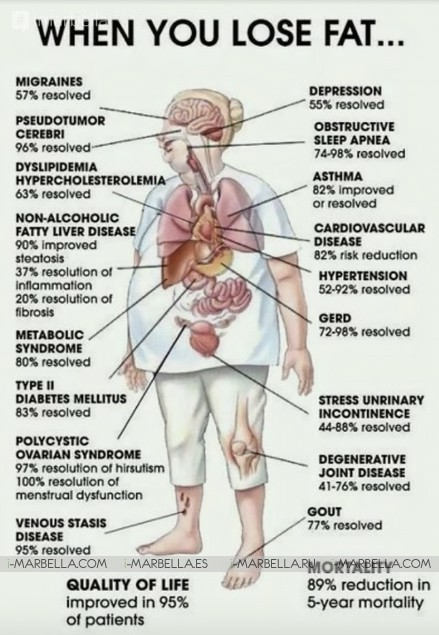 Find below a chart image of the many benefits you can procreate for losing fat weight. In the market there is adulterated honey, many of them are mixtures of honey with glucose solutions, some are ultra-filtered, and the vast majority contain water. This was demonstrated by Vaughn Bryant, director of the Palynology Research Laboratory at Texas A&M University in the USA. He revealed in a study in which he evaluated 60 brands of honey marketed in the United States in small shops, supermarkets, restaurants, and pharmacies with surprising results. Bryant who is a pollen specialist, says that honey that does not contain pollen in its composition cannot be considered honey because it loses all its nutritional and healthy properties. For this reason, his study focused on analyzing the quantity of pollen to determine the quality of the honey under examination. The results were surprising, in the case of small shops 76% of these products did not contain pollen, in department stores 77%, and in pharmacies and fast food restaurants, such as KFC or McDonald's, 100% of the products examined did not even contain pollen. Why Is Sugar Bad For You? Golden Stevia 2019 There's only one natural sweetener good for your health. There are as well syrups that use the word "honey" to deceive the consumer because they are really liquid candies, like soft drinks, for their high concentrations of sugars and lack nutritional value. Now that we have introduced you to some aspects that have been somehow hidden to most sugar consumers. 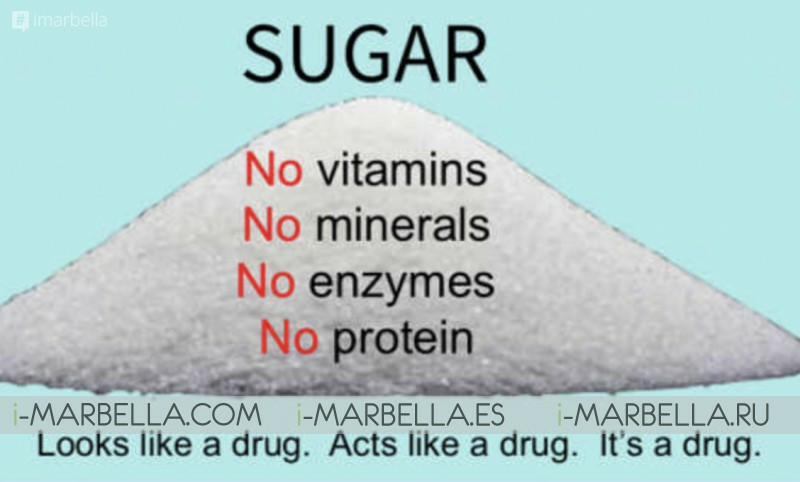 It is important to know real facts about why sugar is bad for your health. A current fact about refined sugars: When you eat refined, processed sugars, they trigger production of your brain's natural opioids (narcotics). A key ingredient in the addiction process. Your brain essentially becomes addicted to stimulating the release of its own opioids as it would to morphine or heroin. ‘’6 reasons why sugar is bad for your health’’. 1. The more sugar we consume, the more dependence we create on it. Why do you think we consume so much sugar? 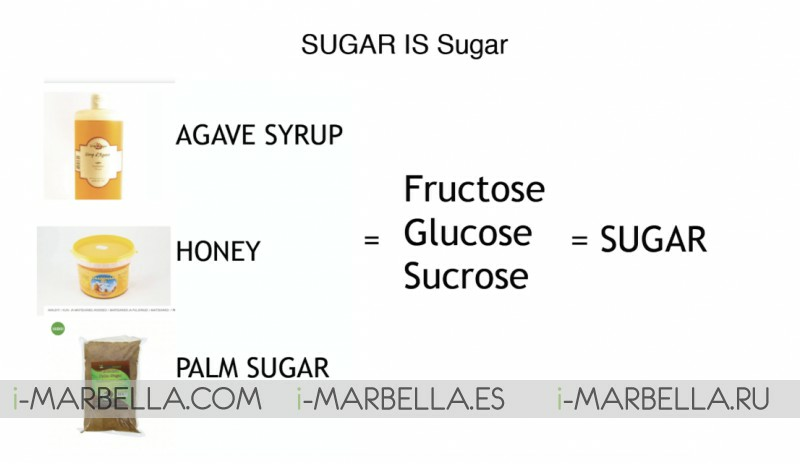 Try to stop consuming sugar in its thousands of forms and you will see how less and less you need. 2. Too much sugar increases cholesterol levels. Studies show that high sugar consumption causes triglyceride increases and decreases good cholesterol levels. 3. Helps you get diabetes. In simple terms, the more sugar we consume, the more insulin must be produced by our pancreas to lower the levels of sugar in our blood, to the point where it can not generate the necessary amount and we will see ourselves dependent on insulin. Result? We will have diabetes. 4. It depresses the immune system. When we consume a high amount of sugar in the form of soda, chocolate bar or dessert, we temporarily affect the ability of our immune system to respond to any challenge it may have. Promotes inflammation. The usual inflammation is a response of our immune system, which is not bad, but high sugar consumption promotes excessive, inappropriate and useless inflammation which can cause ageing and disease. 5. It affects children's health. If there is one thing I have noticed in recent years is the number of children with early obesity. The curious thing is that at least 50% of those I have seen always walk in the hand something that helps them maintain that shape, almost always in the form of a Coke or sweet soda. I've even seen younger siblings fight over a can of soda. And when they're kids they go for big ones. 6. It causes cavities. This one many know it but still, they continue ignoring it. I can bet that dentists have done their best over the last 30 years by putting on dental shims, cleaning teeth and repairing them. The consumption of sugar mixed with poor dental hygiene causes the walls of our teeth to deteriorate thanks to the bacteria that live in our mouth and are activated with any carbohydrate (which happens in the first 20-30 minutes after eating). Another aspect of obesity is that it creates many self-esteem problems in both men and women (although this is more related to our current society) but even so, it is a problem we can avoid. Sugar is not directly related to a diagnosis of cancer, but excessive sugar intake can predispose people to cancer. Is Sugar A Cancer Fuel? Information we can take from the latest studies rule out the direct association between sugar and cancer. The correlation exists because of weight gain. An excess of sugar causes overweight, and this considerably increases the risk of several types of cancer (so far has been found an association between overweight and 13 types of cancer). After tobacco, obesity is the most important risk factor for cancer. In addition, an excess of sugar in the body increases the activity of a protein called β-catenin. This protein is closely linked to the proliferation of cancer cells. It is also known that one of the most serious effects of excess sugar in the body is the development of insulin resistance, which can trigger type 2 diabetes. This type of diabetes has been linked to some types of cancer such as bladder, pancreas, colon, breast, and uterus because excess insulin and insulin growth factor allows the development and growth of cancer cells. If you want to know a little more about this and other topics, look at this and other articles related to sugar consumption and find out what you can do to improve healthy living. As mentioned before we recommend to lower the consumption of sugar more and more, not only in your coffee or tea but in soft drinks, bottled fruit soft drinks, ice cream, desserts, cakes, cakes, candy, cocktails and so on, I assure you that they will be less dependent on candy. 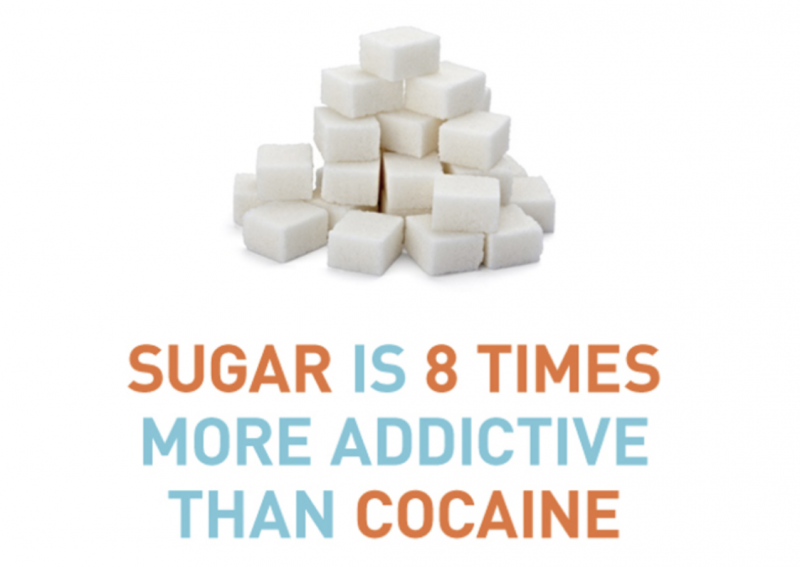 In short, sugar is a very caloric food that can be toxic to your health if not taken in moderation.